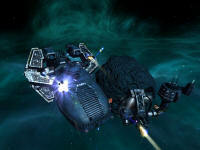 One game that really tests our processing power is Egosoft's excellent X2: The Threat space simulation. Graphically it is outstanding and really tests DirectX 9 graphics cards to the limit. As you can see the processing power of the 3800 has made quite a difference with the game when running with everything enabled.